It’s T minus three days to Thanksgiving, so I’m assuming if you’re here, you’re in one of two camps: 1. You’re looking for a last minute addition to your holiday menu, or 2. You’re kind of like me and you’re still mapping out what you’re going to make. There’s also a third possibility – you don’t celebrate American Thanksgiving, and you would just love a delicious cozy Monday night dinner. 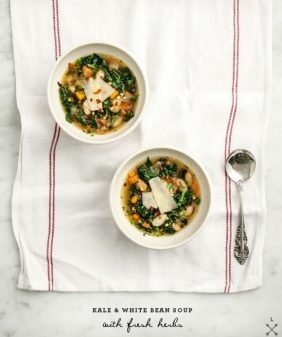 This yummy white bean soup with kale covers all of those bases! This recipe is a sort of non-traditional spin on a classic autumnal wild rice soup. For the record, that’s the first time that I’ve ever used the word “autumnal,” but it’s also the first time that I’ve ever posted a recipe with wild rice(?!) so there are firsts for everything today! We’re partnering with Le Creuset on this post to show you how to #gatherwithcolor this holiday season. When I think of Le Creuset, I think of the joy of simmering soups and stews in a classic, strong, cast iron Dutch Oven – which is the best product for this recipe since it has the ability to maintain heat and is great for a one-pot meal. It’s the kind of cookware that’s been passed down for generations and generations of Thanksgiving-makers. While I have some really old pieces that have stood the test of time, I feel like sometimes you need some old and some new. So I’m loving my new Marseille colored Dutch Oven – it’s a fun pop of color, and it just makes me happy to look at while cooking! 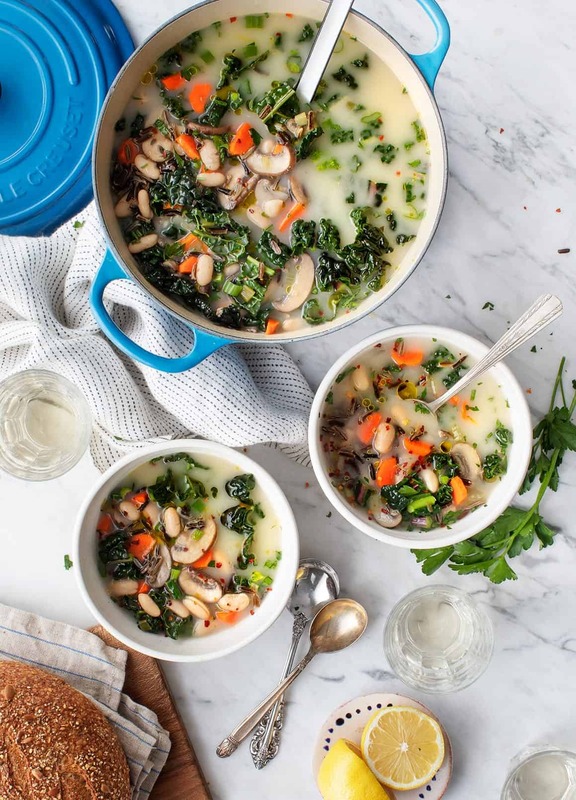 This white bean soup is packed with veggies and herbs, including carrots, mushrooms, celery, kale, rosemary, and thyme. The lightly creamy base is made with almond milk, blended cashews, miso paste, and a touch of Dijon mustard. This is also a perfect make-ahead meal, which I tested by bringing it over to my sister’s house last night for a family Sunday dinner. Just take the whole pot and simmer it on the stove to reheat. Don’t forget the crusty bread! 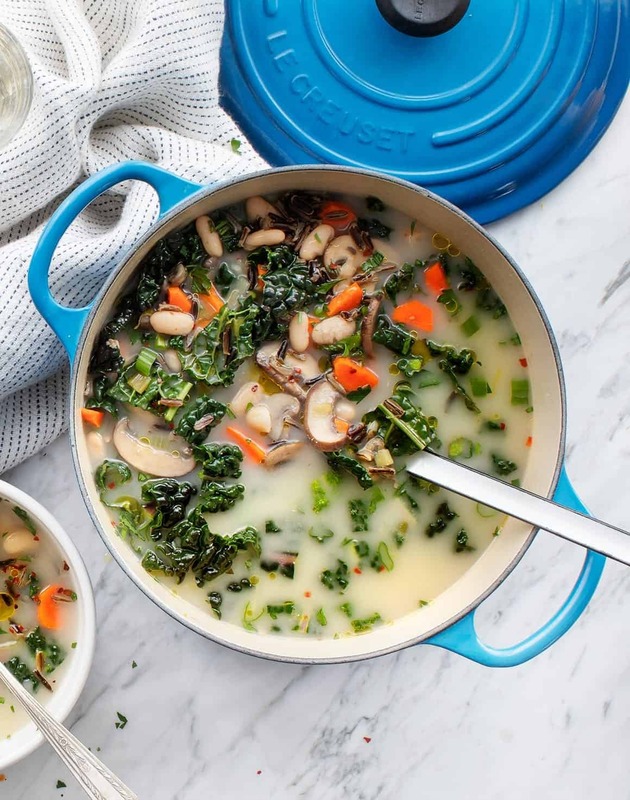 A cozy vegetarian white bean soup with kale, vegetables, and wild rice. Make the creamy base: Place the almond milk, cashews, white beans, miso paste, and Dijon mustard in a blender and process until smooth. Set aside. Add the garlic, rosemary, thyme, cannellini beans, pepper, and water and stir. Cover and simmer for 20 minutes. 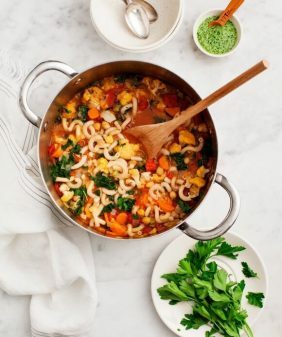 Remove the thyme bundle and stir in the cashew mixture, rice, 1 tablespoon lemon juice, and kale. Simmer over low heat until the kale is wilted, about 5 minutes. Season to taste and serve with more lemon juice, parsley and pinches of red pepper flakes, if desired. Note: If you're not serving the soup right away, it'll thicken as it sits. If desired, stir in up to 1 cup additional water if it gets too thick. This post is in partnership with Le Creuset. Thank you for supporting the sponsors that keep us cooking! I am allergic to tree nuts. Do you think this would have good texture if I subbed in 1 1/3 cup whole milk? 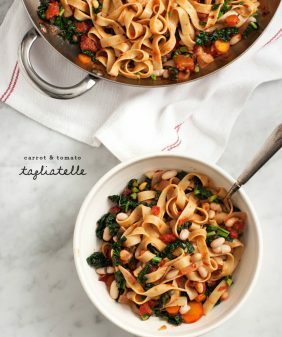 It looks DELISH and I plan to make it after thanksgiving! Hi Katherine, I would try 1 cup of regular cream and then wait to add the lemon until the very end. The cashew blend is a bit thicker than whole milk, and it yields 1 cup. I hope that helps! Oh my gosh!!! It is a cold snowy afternoon in NH and I had to try this soup, it was absolutely delicious!!! I added the red pepper, parsley and scallions on top and the soup liked beautiful. Our belly’s are full and we are warm and grateful! Thank you for this recipe! Well, writing from Down Under we neither celebrate Thanksgiving nor are having to heat our homes 🙂 ! Absolutely moreish soup and a clear video to make certain we know how to toe the line . . . Le Creuset – oh, fell in love with the brand forever ago and would rather use one of the wonderful pots on my stove for an aromatic ‘long cook’ than resort to modern ‘machinery’ cluttering up my kitchen benches . . . 🙂 ! 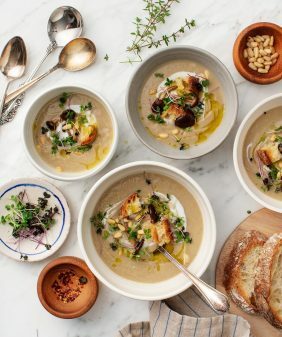 Adding this to my soup arsenal! Just made this and it was so delicious! Such a creative recipe, and all the flavors come together beautifully. I’ll definitely make this again! This will be a family favorite for sure! Sorry, used voice to text ….hopefully you got the drift! 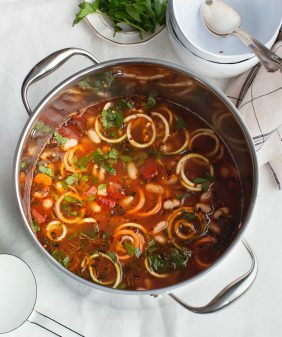 This soup has amazing flavors that keep you thinking about how delicious it was a days later. I did not have miso but looked up substitutes and molasses was a low sodium option. I will make this recipe again…so good. Hi Sarah, I’m so glad you loved it! Thanks for coming back to let me know! Hi! I have some hacho miso but no white miso. May I use this instead? Hi Holly! I’m so glad you loved the soup (and the veggie burgers). Welcome!! This was a much heartier meal than it looked! The flavors are wonderful and it made enough for lunches the next day. Highly recommend giving this a go! Hi Ashley, I’m so glad you enjoyed the soup! Hi Sarah – about 4 days – it also freezes well. WOW. This was amazing. I used homemade chicken stock instead of almond milk, subbed scallions for a leek and used red miso instead of white. Oh, and used flageolet beans. I love the cashew sauce to thicken instead of cream: this is a great trick. Hi Stacey, I’m so glad you loved the soup! Let me know what other combos you come up with! 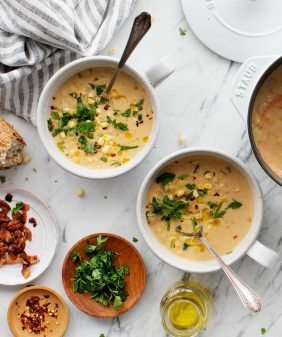 This is an amazing soup! Thank you!